Strong cattle prices have seen more cattle drawn out. With Meat and Livestock Australia’s (MLA’s) weekly slaughter data for last week showing a 2017 high. It seems things settled a bit this week, but rising export meat prices are at least supporting cattle prices. 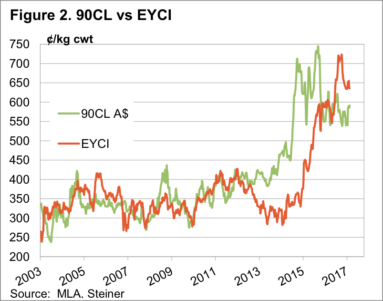 In last week’s cattle commentary Matt noted the strong yarding’s in Queensland, which resulted in the Eastern Young Cattle Indicator (EYCI) losing 19¢. MLA’s slaughter figures for last week, released on Monday show that the increased supply in the yards was also reflected at processors works. 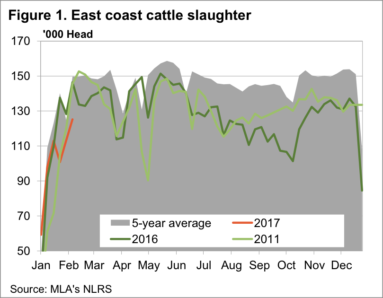 Cattle slaughter on the East Coast for the week was up 11% (figure 1), and just 6% below the same week last year. In Queensland slaughter was up 22% on the previous week, and 10% on last year. Dragging the chain was Victoria and SA, and to a lesser extent, NSW, which were down 29, 27 and 6% on last year respectively. It remains a bit confounding that the supply dearth is concentrated in the southern states, given that the herd liquidation, and subsequent rebuild, should be concentrated in the north. There is some good news on the export front. Frozen Cow 90CL export prices managed to gain some ground this week, hitting a six month high of 591¢/kg swt, (figure 2) despite a rising exchange rate. The EYCI premium to the 90CL has hit an 8 month low of 44¢. Strong support for the EYCI is only 50¢ away. Key cattle areas in Queensland and Northern NSW are expected to get good rain over the coming week. This should reduce yarding’s and provide some support for young cattle prices in the short term. Finished cattle prices usually rise at this time of year as supply wanes. This usually lasts until mid-April, when prices ease. This will be the first test of the market, but strong export prices will limit downside.